In recent decades, biologists have recorded an alarming decline in amphibian populations around the world. While a major culprit is a tiny fungal pathogen, we humans may be ultimately to blame. Frogs are dying. According to recent research, nearly a third of frog and toad species are either threatened or extinct. It’s a frightening trend for a group of creatures (which includes many other species of amphibian) that has over millennia been known for resilience and adaptability. Some of the chief threats to their existence—habitat destruction and global climate change—are familiar and common to other facets of the natural world. But there is a third cause, specific to amphibians, that was only recently discovered and has scientists scrambling to find a cure. In the 1990s researchers in Spain, Australia and Central America discovered that amphibians in rainforests and mountain lakes were dying in increasingly large numbers. The killer, it turned out, was chytridiomycosis, a disease caused by the hitherto unknown fungus Batrachochytrium dendrobatidis (Bd), which has since been found around the world. Biologists were stumped and wondered whether something so sudden and so widespread could be the result of human action. It turns out that they were right, providing further proof that we’re truly living in the Anthropocene. Over the last decade or so, scientists have collected and quarantined thousands of amphibians in a desperate attempt to preserve species. This has in some cases worked; small populations of the Panamanian golden frog (Atelopus zetecki), for instance, remain, though probably only in captivity. But often the spread of the fungus is so rapid that scientists cannot keep up. Panamanian herpetologist Edgardo Griffith told journalist Elizabeth Kolbert that “we are losing all these amphibians before we even know that they exist.” Normally, species preservation in captivity would be a precursor to reintroducing the creatures to their natural habitat. In this case, however, because of the fungus’s ubiquity, restoration isn’t possible. One cannot, after all, disinfect an entire rainforest. And Bd is so widespread that it’s difficult to foresee this situation changing for the better. While many are involved in the rearguard preservation of an entire taxonomy, others are asking the pertinent question: How did this all begin? One theory, interestingly enough, concerns a pregnancy test. The frog test, also known as the Hogben Test based on research by biologist Lancelot Hogben in 1930, was the first cheap and reliable method of testing whether a woman is pregnant. It was a significant upgrade on previous techniques and was used internationally for decades. It involved injecting a woman’s urine under the skin of an African clawed frog. If the woman was pregnant, her urine would contain sufficient hormones to make the animal ovulate. The test was superseded in the 1960s by other methods, so the frogs were discarded and released wherever they happened to be—often not in their usual habitat. The clawed frogs flourished in their new homes, and it was their adaptability and vigor that was to prove catastrophic. Unbeknownst to anyone, the clawed frog carries the Bd fungus, but unlike most amphibians, it is resistant to it. It seems certain that the clawed frog’s proliferation contributed significantly to the worldwide spread of the fungus. Further research suggests that the African clawed frog was not the only perpetrator, however. Other amphibians that carry Bd are traded internationally for a multitude of purposes, from food to medicine to fish bait; and it seems likely that they have also spread—and, ominously, may still be spreading—the fungus. There is relatively little restriction on the international trade of amphibians. There is also some evidence to suggest that Bd originated outside Africa before the Hogben Test was created. The picture is probably even more daunting, as it also appears that Bd can survive outside an amphibian host: in water, on rocks, and in or on other creatures. What is clear is that human mismanagement of the natural world has had an influential hand in this catastrophe. The disaster was probably inadvertent, the consequence of widespread human ignorance and carelessness. No one knew that Bd existed, nor that it would be so devastating to an entire taxonomy, until recently. In the case of the clawed frogs, the hospitals and scientists that discarded them quite reasonably said, It’s just a frog, and frogs are everywhere. A few more here or there won’t hurt. Of course, it did hurt—in enormous ways. Reports indicate that by 2015, 42 percent of amphibian species were affected to some degree by Bd; but even this frightening figure is likely a gross underestimate, as only 17 percent of the more than 6,000 known species have been tested for the fungus. It is a pandemic. 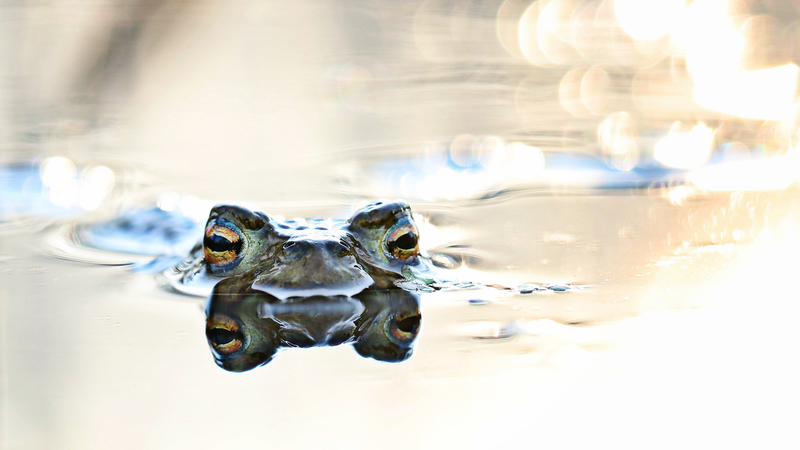 The picture of amphibians’ future is a developing one and is not entirely without hope. There is so much that is yet to be discovered about these creatures and about the fungus itself. Some research suggests that certain amphibians can develop behavioral or immunological resistance to Bd. Whether that immunity can be developed in time is another question. The biblical record states that God gave humanity sovereignty of the world and assigned the first humans to “tend” and “care for” the world. The command specifically referred to animals: “Then God said, . . . ‘let them have dominion over the fish of the sea and over the birds of the heavens and over the livestock and over all the earth and over every creeping thing that creeps on the earth’” (Genesis 1:26, English Standard Version). Whether we are conscious of it or not, it’s inarguable that humanity has that power; and most ethical systems agree that with power comes the responsibility to care for whatever it is we have power over. Surely the frogs do not thank us for our laxity. We have, in this respect, failed them mightily. The scientific response to the Bd epidemic has thus far been twofold. First, there is the late attempt to stem the destruction of amphibian species; and second, an endeavor to change future human behavior (or in biblical terms, to “change the mind for the better” or “think differently” [Acts 2:38]). The tale of invasive species is a sad one: witness the proliferation of rabbits in Australia, or the Nile perch’s destruction of over 200 species of cichlid in Kenya, or the weasels’ decimation of the flightless kakapo parrot in New Zealand. It is merely one of the ways humanity has failed to care for the earth. According to current amphibian trends, we may be facing a time where we have to explain to future generations that Kermit the Frog was more than a hand puppet. With larger concerns about animal life in general in mind, it would be prudent to take the instruction given to Adam to “tend and keep” our environment (Genesis 2:15) most seriously.